Recombinant fragment within Human C4a. The exact sequence is proprietary. Human angioneoplasm lysate, HepG2 cells. Our Abpromise guarantee covers the use of ab170917 in the following tested applications. WB 1/1000 - 1/5000. Predicted molecular weight: 193 kDa. 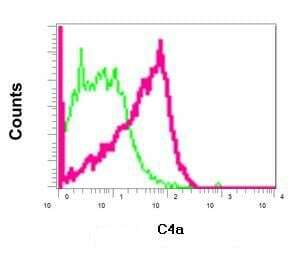 C4 plays a central role in the activation of the classical pathway of the complement system. 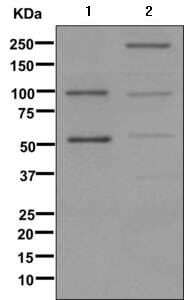 It is processed by activated C1 which removes from the alpha chain the C4a anaphylatoxin. The remaining alpha chain fragment C4b is the major activation product and is an essential subunit of the C3 convertase (C4b2a) and the C5 convertase (C3bC4b2a) enzymes of the classical complement pathway. Defects in C4A are the cause of complement component 4A deficiency (C4AD) [MIM:120810]. A rare defect of the complement classical pathway associated with the development of autoimmune disorders, mainly systemic lupus with or without associated glomerulonephritis. Prior to secretion, the single-chain precursor is enzymatically cleaved to yield the non-identical chains (alpha, beta and gamma). During activation, the alpha chain is cleaved by C1 into C4a and C4b, and C4b stays linked to the beta and gamma chains. Further degradation of C4b by C1 into the inactive fragments C4c and C4d blocks the generation of C3 convertase. Flow cytometric analysis of permeabilized HepG2 cells labeling C4a with ab170917 at 1/100 (red) or a rabbit IgG negative (green). ab170917 has not yet been referenced specifically in any publications. Publishing research using ab170917? Please let us know so that we can cite the reference in this datasheet. There are currently no Customer reviews or Questions for ab170917.